On Saturday 19th November two of our volunteers, Tom Cavanagh and John Dodd, delivered the first official tours to the public on the museum’s art and poster collection at the Acton Depot. Visitors had the opportunity to take a peek at the extensive collection of works held in the art and poster stores, and learn all about how many of the works were made, why they were commissioned and how they came to be in the London Transport Museum’s collection. The art and poster stores are usually closed off to the public, and can only be accessed whilst either being supervised by staff or as part of a tour. Access to the Museum’s art and poster collection has been growing steadily this year, with a number of Poster Parade exhibitions at the museum in Covent Garden and regular features on the museum’s blog. And now we have tours of the collection too! Throughout this year a number of our volunteers have spent many days being trained by our Safety and Citizenship, Visitor Services and Curatorial staff. One of the great things about volunteering with London Transport Museum is that our staff have a very hands on attitude, which allows our volunteers the opportunity to work closely alongside staff giving them a great insight into any tasks and projects they get involved with. Our volunteers have worked very hard researching their content, practising delivering and ironing out any small creases to the point they are feeling very comfortable with giving tours to willing visitors. 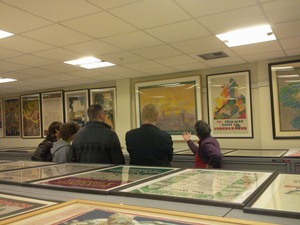 Our next scheduled tours will be in January 2012, so make sure to book a ticket while you still can!